WrestleMania 35 took place Sunday night at MetLife Stadium in East Rutherford, New Jersey. The 35th installment of the Showcase of the Immortals was headlined by Charlotte Flair, Becky Lynch and Ronda Rousey all striving for the Raw and SmackDown Women’s Championships. 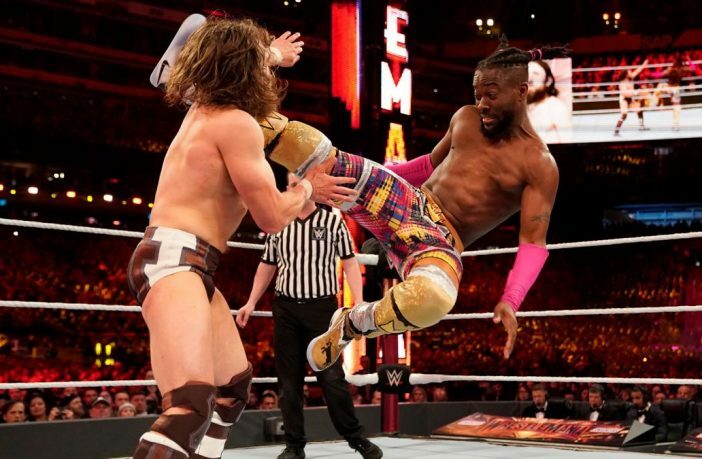 Elsewhere on the card, Kofi Kingston looked to realize an 11-year dream fighting for the WWE Championship against Daniel Bryan. Triple H tried to keep his career alive in a No Holds Barred street fight against his former friend and Evolution associate Batista. And in the opening match on the card, Seth Rollins looked to slay the beast and capture the WWE Univeral Championship from incumbent champion Brock Lesnar. Considering the abundance of high-profile title matches with babyface challengers on this card, I wasn’t too surprised to see one match early on in the show to space everything out. Admittedly, I wasn’t expecting to see the Universal Championship match kick off the show, but for how high-octane and high-energy this match was, it was the perfect choice. Brock took the tried and true heel route of attacking Rollins before the bell and began rag-dolling Seth every which way around the ringside area. Brock’s beatdown was so convincing, Seth was even sporting a sizable red mark on his lower back. It looked like this match would follow the same result of Brock’s matches with AJ Styles, Daniel Bryan and Finn Bālor, but after multiple suplexes, knee strikes and clotheslines, Seth took advantage of Brock bumping into the ref by executing a low blow followed by three-straight Curb Stomps to become the new Universal Champion. Although Lesnar dominated roughly 90 percent of this quick match, Rollins did all he needed to do to get the three-count for the win. A good match, although I thought these two could have created a bit more of a dramatic story with a few more minutes of time. This was my pick for the potential match-of-the-night based on both guy’s work ethics in the ring in the last few months. But I don’t know what it was: This match just didn’t have any “oomph” behind it. Both of these two have had some entertaining promos on SmackDown Live in the last few weeks, but this just felt like a “paint-by-numbers” match. Orton hit all his signature powerslams, knee drops and RKOs, and Styles hit his 450 splash, Pele kicks and a final Phenomenal Forearm for the win. Wrestling-wise, this was a solid match, but something about this just fell flat. I’d like to see these two get another match-up to try this again. Unfortunately, the only story coming out of this match was a sizable portion of the crowd not being able to check it out for themselves due to the multiple large and bright spotlights focused on certain parts of the stadium for lighting effect. Good, but something was missing. While thrown together just five days prior to the event, on paper, all eight of these guys have proven themselves as knowledgeable and exciting workers on the main roster. Shout-out to Ricochet and Cesaro for creating two very GIF-able moments in this match on each other with Ricochet’s huricanrana and Cesaro going for a record-breaking Cesaro Swing. I also enjoyed Sheamus’ spot giving the Beats of the Bodhrán to nearly every other member of the match. This was just constant, non-stop action from the opening bell. Out of the three matches on the card so far, this was my favorite early on in the night. Since this was such a bitterly personal storyline with Miz’s admiration of Shane McMahon and the latter’s attack on the former’s father, I really liked Miz’s opening rush at Shane right after the opening bell rather than going for a standard lock-up. Shane did a great job doing the trademark cowardly heel routine of running around the ring and luring Miz into a trap to get a few quick punches in. The introduction of Miz’s father into the match was a great storytelling technique to build some more heat for Shane and to spark a fire in the Miz to avenge his father. Shout-out to Shane for being a bumping machine in this match and falling from all kinds of platforms, especially one that looked like he fell onto the top of a golf cart and ultimately, a concrete floor. While I loved 99% of this match, and especially the giant king-size superplex off the camera platform, I wasn’t the biggest fan of the ending. I would have liked it a little bit more if Shane slowly crawled over for the pin rather than just laying after the superplex waiting for the referee’s pin. As minuscule as that sounds, I really think that would have made for a bit more exciting action in the match’s dramatic final seconds. Nonetheless, I really enjoyed this match and it was one of my favorites from this jam-packed card. I don’t know if the fans in MetLife were just tired from the Miz-Shane match before or they didn’t have any invested interest here, but the crowd went near-silent when this match began. At times, I thought this was a little too “TV” and not enough “pay-per-view” in terms of the action, but this did have a few very cool moments like Natalya’s double-Sharpshooter on Boss ‘N’ Hug and a huge Glam Slam from Beth Phoenix. I was a little surprised the Iiconics picked up the victory, seeing as though I predicted a Boss ‘N’ Hug retain, but I’m open to them going on a heel run antagonizing the SmackDown roster and audience. Congrats to both women on bringing a WWE Tag Championship to the Land Down Under. If you could go back in time five years ago and tell your five years’ younger self that this would be the WWE Championship match at WrestleMania 35, would you believe it? I certainly wouldn’t! But this match and feud is nothing short of a testament to the organic popularity Kofi Kingston has cultivated in his decade-plus on the main roster and Daniel Bryan’s excellence as a heel. In the ring, this was a perfect clash of styles with the high-flying striker in Kingston being grounded early on by the methodical submission grappler in Bryan. 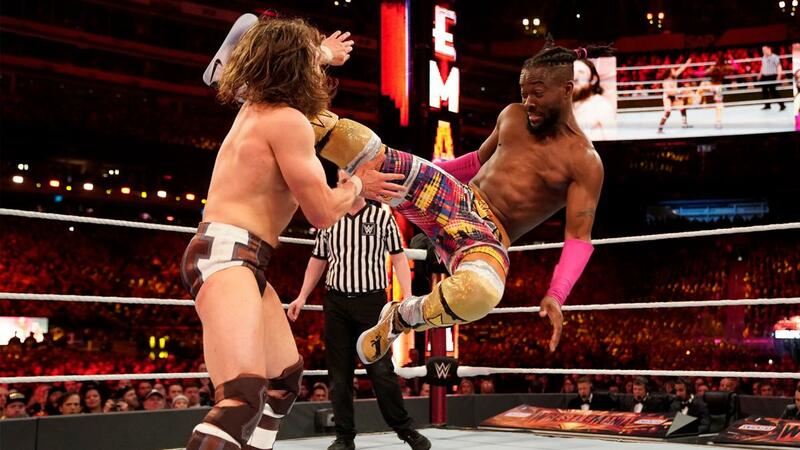 Anytime Kofi would try to gain any bit of momentum, Bryan would drag him back down to the mat and attempt to stretch him out, especially to his chest, abdomen and back. The storytelling in this match may have been great, but the crowd in close unison backing the New Day elder took it into legend status. Every near-fall and submission attempt had the crowd on the edge of their seats and added so much more tension to one of the most dramatic points of the night. All the credit in the world to Daniel Bryan for putting on one of his best wrestling performances in recent memory and being the perfect heel and foil for the lovable Kingston. No disrespect to Ronda, Charlotte and Becky, but this to me was the emotional highlight of this show. Kofi, Bryan, New Day, Rowan, the New Jersey crowd, the announcers, everyone else. Hats off to everyone for pulling off this true WrestleMania moment. When Rey Mysterio was making his way to the ring (shout-out to him for the cool Mysterio ring attire, as well), any fears I had that he was still carrying an injury from Monday’s match with Baron Corbin dissipated. But considering how short this match turned out, perhaps Rey had enough energy to suit up but not to work a long match. I’m going to withhold a rating because hardly any action happened to warrant one. This match followed a pretty straightforward, white-meat babyface match formula: Roman gets the jump on McIntyre early for some big strikes, McIntyre takes over control for the midway portion of the match and starts trash-talking Roman about how he broke the Shield and beat both Seth and Dean Ambrose in the weeks prior to WrestleMania before Roman breaks free and takes over control in the match’s climax. This was a fine match, but it suffered from the same problem Styles-Orton had in a lack of heated investment behind it. A tired audience worn out from Kofi-Mania didn’t do this match any favors, either. It wouldn’t be WrestleMania without an over-the-top Triple H entrance, but I’ll admit I really enjoyed the Mad Max theme this year. For all the stiff and sadistic shots with a chain, finger manipulation with a wrench and nose ring mutilation with a pair of pliers by Triple H, I thought it all made sense in storyline for Triple H to get revenge for Batista’s attack on Ric Flair. Speaking of the 16-time* World Champion, I loved adding him into the ending of the match firing up a groggy Triple H and taunting a distracted Batista. Overall, this followed the “Triple H” formula of a drawn-out brawl all around the ring that builds in drama like a slow cooker on a stove top. For every table spot, weapon introduced and grandstanding taunt, this was a very good match and one of Triple H’s best singles matches in quite some time. Hats off to Batista as well in what appears to be his final match in a very worthwhile send-off. A very good brawl. I’m still a little disappointed in Corbin getting the nod for Kurt Angle’s supposed final WWE match, but I will recognize it is an instant heat magnet for a character who has not been a part of a high-profile feud in 2019 as of yet. Hopefully, this is the start of something substantial for him as a character going forward. As for the man of the hour, we got all of the Angle trademarks in here from the moonsault to the German suplexes to the Angle Slam and Ankle Locks. For a man that has put his body through the ringer on a mat and in a ring for the last 20 years, Kurt can hold his head high for leaving MetLife Stadium on a high note. I feel confident in saying that we will never see a character like Kurt Angle in a WWE ring again. Sure, Chad Gable exhibits a lot of Angle-esque tendencies on TV, but I cannot recall another person who came to WWE and instantly took to it like a duck to water and played a great hand in creating so many great matches and segments that are still etched in stone in the minds of those who appreciated all his work. The Demon jumped right out the gate with a huge spinning heel kick and bicycle kick to the Intercontinental Champion. One common critique many have of Demon Bālor is that his demeanor and move-set don’t differentiate enough from his normal, leather jacket-clad persona. Tonight, I think Bālor did a solid job trying to stand out by snarling after every big strike and executed move as well as the powerbomb that I thought was sold well enough that I thought “Finn” wouldn’t be able to pull it off, but the “Demon” could. This was a quick match, but it was all gas and logically back-and-forth to where it looked like Lashley could have picked up the victory a few times. This is it. This is what the last four years have been leading up to. From #GiveDivasAChance, to the Four Horsewomen of NXT, to first-time ever’s inside Hell in a Cell and the Elimination Chamber, to the Revolution turned Evolution, this is the culmination of years of fan outcry and support toward a shared goal where the women of WWE could be viewed on equal footing with the men. This is the end result of years, let alone months of build-up between these three women. The most prolific Women’s Champion in WWE history. The most organically popular woman in company history proclaiming herself as “The Man” of WWE. The most mainstream household name to come to the WWE and lace up a pair of boots and take the WWE by storm within a year of her debut. This was the only choice that could make sense as the main event of WrestleMania, and the best choice at the same time. As for the match itself, I thought this triple threat did a great job of balancing the pace between nonstop attacks one-after-another and two opponents slowing down the pace for a few seconds to focus the drama on each other. Ronda started out the match with a number of lightning-quick kicks and strikes to light up Charlotte and Becky. While this makes Ronda’s offense stand-out from the rest of the roster, she should try and slow down her pace in the ring a bit because a lot of her strikes don’t look like they hit. Many of Charlotte’s big offensive moves came in the way of a big boot running at full speed and Becky seemed to be always aiming for her opponent’s arms in an attempt to lock in a Disarm-Her. There’s a lot of controversy online about the ending of this match ending in a pinfall where Ronda’s shoulders clearly weren’t down for a three-count. As it stands now at press time, I thought the ending made for an easy explanation for Ronda to have a claim for a future title shot because she wasn’t down for a full three-count. Additionally, Charlotte can claim that she was never defeated and thus, she deserves a one-on-one opportunity at the championship(s). Admittedly, this match would have had a more visceral and emotional reaction from the crowd if it would have ended with a submission tap-out ala Daniel Bryan to Batista at WrestleMania 30, but I suppose it’s not a huge deal since (in storyline) the babyface won to send the crowd home happy, albeit late into the Eastern Standard Time night. I just wish these three had just a little more time (in an already jam-packed five-and-a-half hour show) to take this match from good to great. Overall Thoughts: I’ll admit that I enjoyed this WrestleMania more than last year’s. There was some great action, some memorable moments, blockbuster entrances and, while a long show, an entertaining one. Match of the night honors go to the WWE Championship match followed by Miz-Shane McMahon and Batista-Triple H. I’ll also give a mini-shout-out for John Cena breaking out the “Doctor of Thuganomics” chain and “WORD LIFE” brass knuckles one more time for taking me back to my childhood and creating a WrestleMania moment with Elias. My least favorite match on the card would probably be the Samoa Joe-Rey Mysterio United States Championship match that ended way too early, albeit hindered by certain circumstances. While WrestleMania has become a marathon affair in recent years, I for one really enjoyed this show.